Industry 4.0 is changing the way manufacturing industry operates. 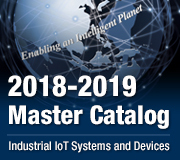 Increasingly more manufacturers are leveraging advanced technologies such as robotics and automation systems to improve productivity and efficiency. As a result, human–machine interfaces (HMIs) are becoming more important in their role in the digital connectedness of humans and machines[JC1] . However, using the wrong HMI can lengthen development times and increase implementation costs. Taking RISC-based HMIs as an example, their simplified instruction architecture makes it difficult to design a versatile system for robotics, and future system expansion tends to be limited. Once such an HMI has been adopted, additional hardware may need to be purchased in order to complete the system. This not only complicates the system configuration but also requires additional effort and time to be spent on program design and system maintenance. Advantech’s PPC-3120S is an x86-based industrial panel PC. The applicability and availability of this hardware platform makes it suitable for developing robotics and automation systems. 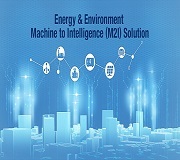 Moreover, it provides value-added benefits for system developers such as useful accessories and intuitive software, thus enabling the realization of human–robot control and MES management. Power-failure protection mechanism to ensure the reliability and stability of the system. Advantech provides a total solution that met KUKA Robotics’ needs. The solution included the PPC-3120S ultra slim panel PC, WebAccess/HMI software, and the PPC-IPS-AE uninterruptible power supply (UPS) module. The project contains two parts: human robot control and MES management. For the human–robot control, the PPC-3120S was installed to provide an HMI for each work station. This unit was responsible for receiving work orders from the MES via the network while also being connected to PLCs via Profinet in order to control the robotics. It also displayed the SOP to help ensure that staff perform their job properly. For MES management, the PPC-3120S can act as a general computer for assembly line operation monitoring and rework management. 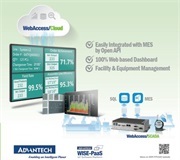 With WebAccess/HMI, all panel PCs can access the automated production management system via IE. The PPC-IPS-AE also ensures continual operation even in the event of a temporary power outage while also protecting the panel PC from being damaged or losing data. With a compact form factor and fanless design, the 12.1” PPC-3120S is an ultra-slim industrial-grade panel PC that users can freely install at their own convenience. The Intel® Celeron® N2930 processor ensures that the PPC-3120S delivers high-performance computing in an x86 development environment, providing flexibility for system developers in designing a multifunctional system. Equipped with a die-cast aluminum alloy enclosure and a touch screen with an IP65 rating for the front panel, the PPC-3120S also offers anti-shock and anti-vibration that make it solid and highly durable. For software, WebAccess/HMI provides a convenient graphical programming environment for system developers to intuitively create HMI screens, thus reducing programming time. With its browser-based interface, users can remotely engineer, monitor, and control the system via any standard browser such as IE. 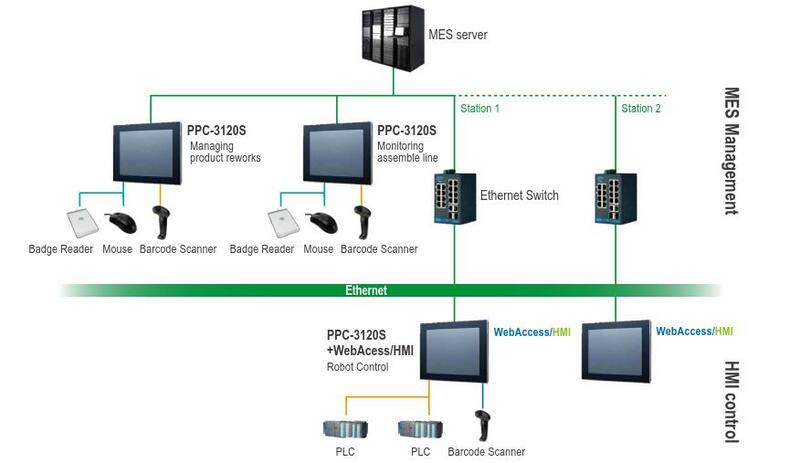 Supporting hundreds of industrial communication protocols, the PPC-3120S can be connected to a range of devices such as PLCs. For power, the PPC-IPS-AE is a lightweight, intelligent power management module. Unlike a typical UPS, which can only be set via hardware, the PPC-IPS-AE comes with a useful software utility for users to configure and monitor the power supply. 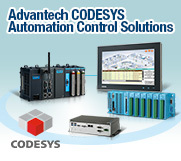 Industrial panel PCs are becoming essential tools for factory robotics and automation. Choosing the wrong product can lead to many problems, including lengthy implementation times and increased setup costs, but the right choice can ensure smooth operations. 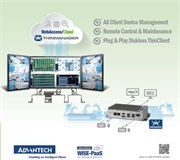 Advantech’s PPC-3120S is an aesthetic, durable, and feature-rich ultra-slim panel PC that can be intuitively operated using WebAccess/HMI software. Furthermore, the PPC-IPS-AE UPS module adds more value by ensuring system stability. This total solution has helped the KUKA’s developers to easily complete system development, thus meeting their client’s requirements. KUKA Robotics has gained satisfactory results, prompting the company to continue using the PPC-3120S in other projects.